Techni Mobili L-shaped Glass Computer Desk is designed with a sturdy body made of steel with a shiny top made of hardened glass. The computer desk is light in weight and its L- shape makes it fit well on open floor or when tucked into a corner. The desk is very attractive and enhances the aesthetic appeal of the general office appearance. This L shaped glass computer desk adds a modern look to your office, adding to the overall ambiance. This L-shaped Glass Computer Desk is designed to fit in both middle and high-class offices. The desk comes with an ergonomically created finish that makes it easy to clean and maintain. 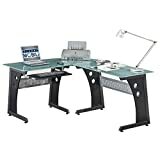 The desk also has one long as well as a short side that are interchangeable meaning that the shorter side can be affixed to right or right of the longer side. This makes it easy to have an arrangement that best befits into your designated office space. This computer desk is constructed using strong and light materials with little chance of damage while being transported. The computer desk also comes with an attached slide out keyboard shelf that is constructed using crafted wood. The shelf easily slides out to allow you to use the keyboard and to slide in later. The desk also comes with a safety stop to make sure that it does not fall on the ground. The desk stands have rubber stoppers that makes it stick to the ground and avoid it slipping all over the floor. The glass that makes this desk is heavy duty with an eight millimeter tempered safety glass that is shattering and scratch resistant. The MDF panels are coated with PVC and has a powder coated steel frame, which is resistant to rust. Techni Mobili computer desk is a durable, beautiful long lasting addition to your office workspace. This desk can be used for reception or secretary’s office. You can easily mount a computer desktop on it and leave a lot of room for other appliances such as documents, fax, and telephone. This is a great alternative for your office, especially if you do not want the traditional oak desk. This will boost the look of your office shows originality because most in most offices you always find traditional oak desks at reception. Techni Mobili L-shaped Glass Computer Desk can sit pretty both the secretary office and revolving chair. The best feature about this desk is that it can be used by two people, on the longer side and the other at the shorter side in a busy reception. You can easily mount a client’s chair on the outside so that they sit facing the receptionists.